In late 2010, as Ruthie, Corie and I were in the final throes of preparation to cross the Pacific and head for points further west, occasionally someone would ask how long we anticipated we might be gone. "Three or four years," I would say, shocking the person asking the question. Who goes traveling for three or four years? It's rare that someone goes for three or four months and even three or four weeks can be seen as a lengthy trip amongst many people. 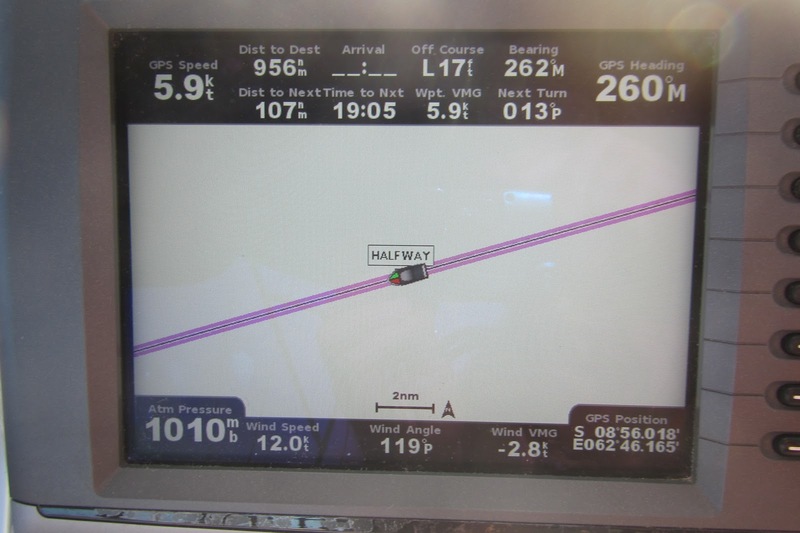 Our present passage across the Indian Ocean is where we have crossed our halfway mark - 062°46.17' East. I calculated this coordinate based on the longitude that's printed on the cocktail napkins at the San Diego Yacht Club. Who would have thought that a cocktail napkin would be the source of information for a navigational computation? Granted, we're not at SDYC's antipodal - we'd have to travel almost 1,500 miles south from here to reach the exact opposite side of the world to do that and there's some very rough water down there. So, our trip is longer than planned. Amongst our cruiser friends who are also on the Round the World route, we're going much too fast as we've only been gone 4 years, 5 months and 17 days. There are cruisers who have spent that much time in Southeast Asia alone and quadruple that for their own RTW route. There is so much to see and so much we have missed that often when we're making a decision about what we will see and what we won't, we kiddingly say that we'll see the missed sights on our next time around. Our perspective on time has certainly shifted - while in Southeast Asia, time was divided by the monsoons and now that we're heading to the higher latitudes of the southern hemisphere, we once again concern ourselves with the traditional four seasons. If we're now halfway around the physical world, does that mean it will take us another 4 years, 5 months and 17 days before we get back to San Diego? That's hard to say. This year will see many miles under Rutea's keel while last year saw virtually none. We should be in Madagascar by early June and we'd like to be in South Africa by July, however, we'll be transiting the Mozambique Channel in the beginning of the southern hemisphere's winter and it has a nasty reputation even in the best months. Still, we know of people who did it last year and there's excellent weather forecasting available so we're optimistic. If things go according to plan, we'll fly home in August (hopefully visiting our son in the UK first) and then return to South Africa in November. This passage has been good so far but the winds have been very light and we have a very limited amount of fuel. Our criterion for starting the engine is if our speed drops below 3 knots per hour and it's entirely possible that we might have to adjust that down even more. On the other hand, our weather router for this passage has warned us that we will need to brace ourselves for the high winds that are usually found around the northern tip of Madagascar. It might be uncomfortable but at least we should make good time. The weather now is fine - hot to be more specific - the Indian Ocean is a deep sapphire blue, the sky bright blue spangled with puffy white clouds. This lifestyle still appeals to me. The people we've met, the friends we've made, the places we've seen, and even the long passages at sea have made durable memories that are my treasure. Rutea remains incredibly solid and her systems continue to function well albeit with the occasional hiccup but that's part and parcel to cruising. Our expectations have been exceeded. We journey on, confident in our ship and ourselves.